This week’s Halloween treat combines two great tastes that taste great together — witches and vampires! Because we have a witchy woman who curses the man who spurns her, and he becomes a vampire (c’mon, who hasn’t felt like throwing a little curse action?). Let’s look at Dark Shadows: The Vampire’s Curse, which is a 2009 compilation about all the spooky backstory for Barnabas Collins and how he became a vampire in 1795 at the hands of the dissatisfied witch Angelique Bouchard. 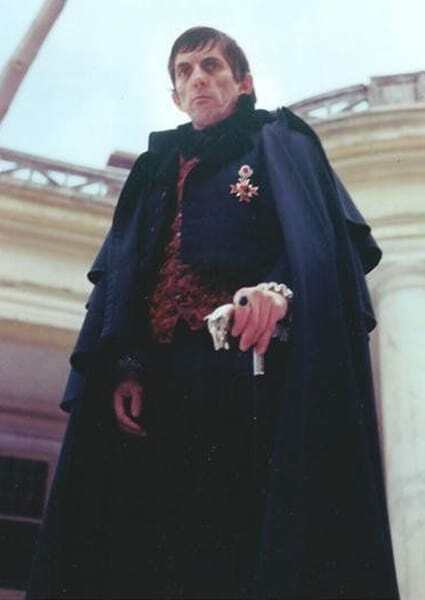 Barnabas would then be awakened in 1967 to participate in the soap opera that was the lives of his descendants in the TV show Dark Shadows, which aired from 1966-1971. Sorry if that doesn’t make any sense, but just go with the flow. Essentially, it was a late-’60s soap opera that threw in a vampire and a bunch of spooky stuff, and ratings shot through the roof (and yes, there were TV revivals in the late ’90s / early 2000s, plus a 2012 movie with Johnny Depp, but we’re not going there). Things are gonna heat up, baby! The original Dark Shadows was campy and kooky and great fun in that way that vampire shows should be, IMNSHO. Either vampire movies/shows should be cuttingly, icily cool and serious, or they need to be aware of a certain preposterousness of their existence and play into the cliches. 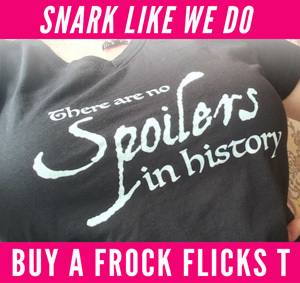 Dark Shadows was the latter, lovingly so. The best soap operas also understand the trappings of their genre and use them well, and adding a supernatural element is the crowning glory of soap operatic awesome. I’ll be your vampire for the evening. Barnabas Collins (played by Jonathan Frid) doesn’t get a lot of credit for being a very influential vampire character, but he may have advanced the ‘vampire lover’ trope earlier than anyone in mainstream media. Previous screen vampires, such as Bela Lugosi’s Dracula, were elegantly evil at best — a weirdly seductive figure, but not a byronic boyfriend. 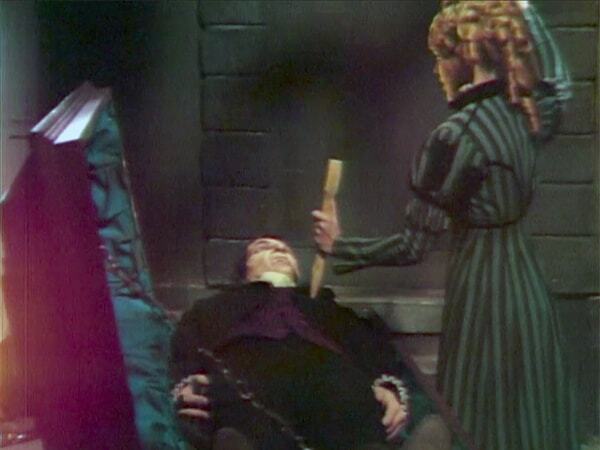 Barnabas’ main storylines revolved around his lost true love (Josette) and his jealous spurned lover (Angelique). Plus he hooked up with other mortal ladies along the way. He was a serious vampire lothario! 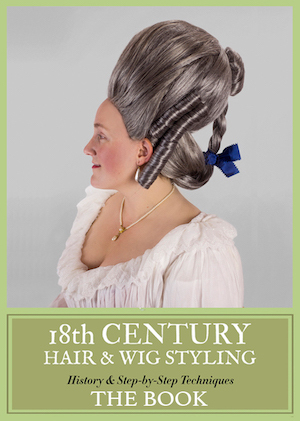 The story beings in 1795 with requisite 1967 hair. Angelique Bouchard (played by Lara Parker) is a constant antagonist to Barnabas, but occasionally his ally and even his wife. With her witchcraft, she can control spirits, move objects, even travel through time. 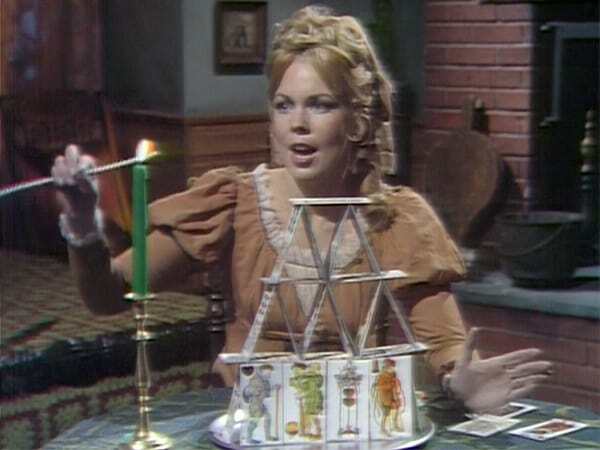 While she is obsessed with Barnabas, she still takes other lovers for fun and for spite. This is a soap opera after all, and bed-hopping is required. Amongst the romance and back-stabbing, stories played riffs on gothic literature with allusions to Frankenstein, Jane Eyre, Edgar Allen Poe, and Wuthering Heights, and H.P. Lovecraft for some legit horror ambiance. Sparks fly when Angelique and Barnabas first meet — in fact, they talk about having already shared some special nights together in the tropics. 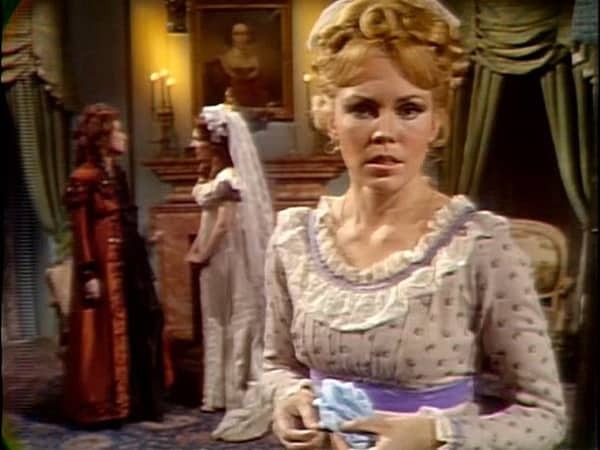 But Angelique is not too happy that Barnabas would prefer to marry the fancy lady of the house, Josette. Black magic is the obvious answer! Hilarious coincidence that in the season 3 episode of Outlander, “Freedom & Whisky,” 1960s Scots fellow Roger is watching Dark Shadows. I knew I liked that guy for some reason! Are you a fan of this spooky soap opera too? Loved Dark Shadows as a kid and tried to go back and watch from the beginning a few years ago. Took too long to get to Barnabus and gave up. Might have to give it another try. That’s why I enjoyed this compilation (it’s on Amazon) — it’s just the Barnabas story! Same here – years ago I used to run home from school to watch it. Then I tried watching reruns several years ago and wondered what all the fuss was about! Never heard of Dark shadows before the film… Can’t say I was impressed. But I remember some Eva Green portraits that were great! We’d run home from school, a whole pack of us, and watch with the moms sitting behind us, laughing at how scared we’d get and how sincere we were. (We’re talking age 8-13, for crying out loud.) Barnabas was the BEST BEST BEST. I tried to watch reruns later, but the wobbly sets and the zippers up the back (which I didn’t notice when I was EIGHT) spoiled the fun, sadly. But Jonathan Frid was a treasure. I was in high school at the time and couldn’t get home fast enough to make sure I didn’t miss a single episode. The best was when we were heading to the house that was directly across the street from the elementary school. Anyone else’s house and we had to run. 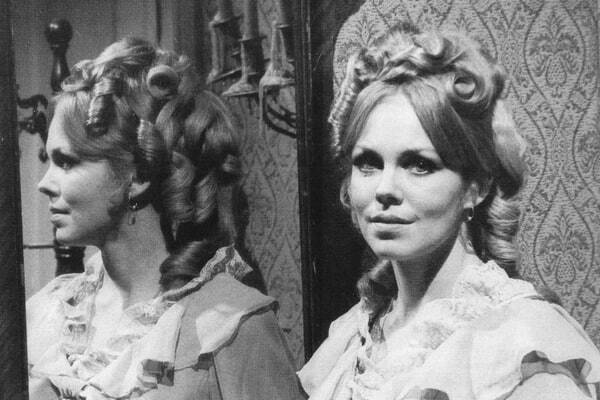 I am a huge Dark Shadows nerd — I own the whole series on DVD and have watched it all the way through several times. Thank you for posting this!!!! From the historical costuming perspective, the costume designer, Ramse Mostoller did wonders with her limited budget, she rented theatrical costuming so forgive the questionable fabrics, and zippers. She did a fine job, IMHO, of dressing the cast when the story lines time traveled back to the 1790s and later, the 1890s. She also chose classic styles — a-line dresses, skirts and sweaters — for the stories set in the 1960s; clothes that never went out of style and prevent the show from looking too dated. I can’t say anything nice about her replacement who came on board in the 1970s and was a fan of polyester and pseudo-hippie crap. Ditto the hairdresser who, as you may have noticed, thought that everyone before 1950 wore sausage curls. You can tell it’s on a budget, but for 1960s TV, it’s not bad! And the costuming really helps evoke the mood, along with the production design. The crazy modern hair is kind of my favorite part tho! If you’re a Dark Shadows fan, you might like the audios by Big Finish. I blame Dark Shadows (and a very early addiction to Gothic literature) for the fact that I’m a Goth. I used to have to sneak watching it, because my little sister would watch with me, and have nightmares. Came home from acting school watched “Dark Shadows,” then walked the dogs. They headed for the door when they heard the closing theme. Some time later, when we moved to Staten Island and the dogs had a yard to run in, I played the DS record. On the opening theme, no response from the dogs, but on the closing theme, they headed for the door. It took three tries for me to hear it: behind the closing theme was the sound of the waves on the rocks at the base of the cliff. Fun show, with enough ham to stock a deli. I also remember Dark Shadows. I was definitely Team Barnabas Collins over his werewolf cousin, Quentin and the modern men who were kinda wimpy. But I thought his OTP was Dr Julia Hoffman. Another one here who ran home from school to watch Dark Shadows (and as my parents also let me watch the Prisoner and Wild, Wild West, what were they thinking?). Despite being a brunette, I went twice as Angelique for tricks or treating. Also, mainly Team Quentin. I used to babysit for a woman who shall hereinafter be known as Ye Towne Pump or YTP for short. I was sitting for her on the condition that she be back in time for me to go see Jonathan Frid at an appearance in the park in the afternoon. Needless to say, YTP did not make it back until the wee hours of the morning and I never sat for her again. Yes, I’m still nursing that grudge. I have loved Dark Shadows since it was rerun on Sci-Fy when I was 8. It is my comfort show and Angelique is my hero! Couple years ago I was here for Halloween and I sat in hot rollers for 7 hours to try and get that hair… didn’t work at all.